…is more coffee! 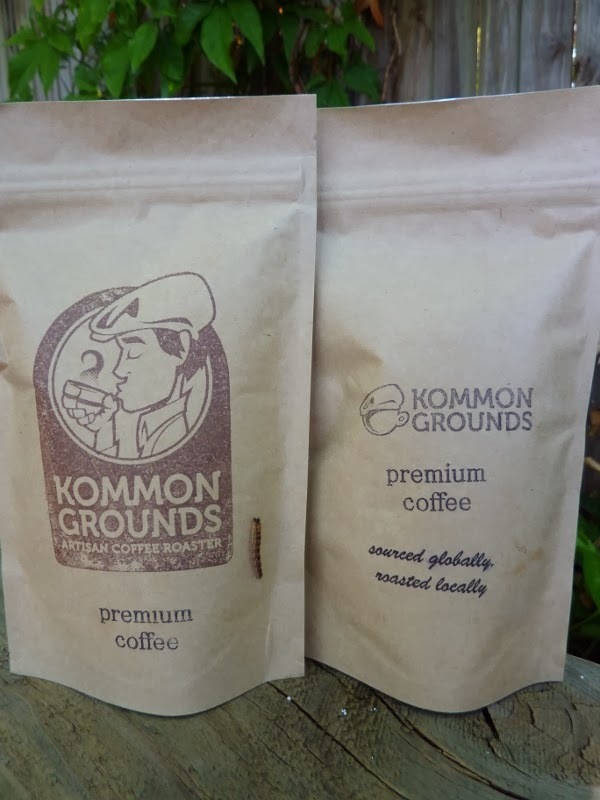 Produced in South Australia, we received these packets of Kommon Grounds when we went on a Coffee Crawl during the Adelaide Food Festival earlier in the year. The crawl was led by Kommon Grounds owner Dorcen, looking just like his flat cap logo. Nothing screams fun like 6 espressos in 2 hours! If you look closely, you can see a little traveller from my back garden making it’s way up one of the packets. 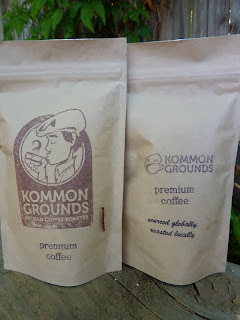 This is the last of the coffee freebies that I’ve picked up from various festivals, gift bags, prizes etc. I haven’t had to pay for coffee or coffee beans since Easter so it’s going to be a bit of a come down isn’t it? …are fresh beans. 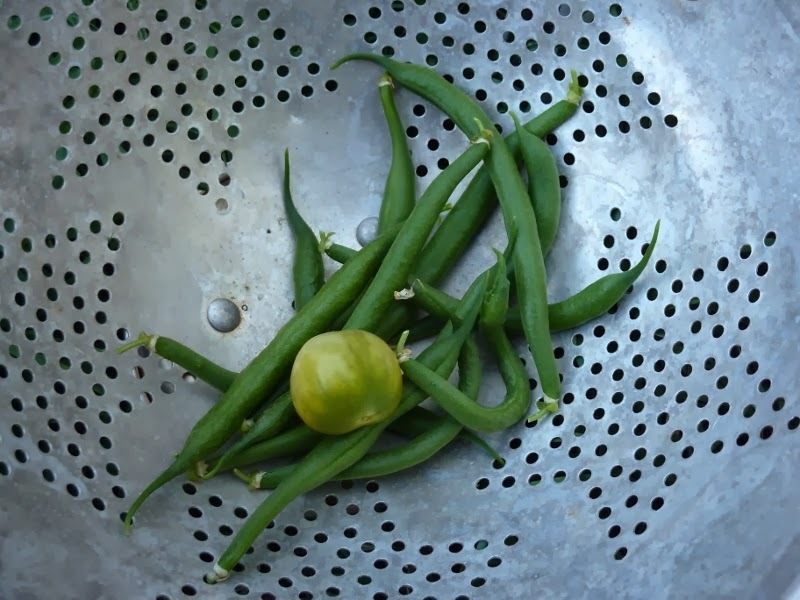 There is a slow and steady stream of beans coming from the plants in the back garden. Most days these go in salads raw but ocassionally they make it on to the dinner table. 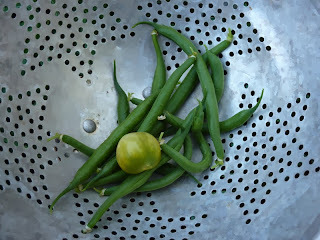 The tomato in the photo is also from the same garden. Though not ripe, it dropped off the plant so it seemed a shame not to retrieve it and put it to use. It went into a salsa on a salad wrap for Sunday lunch. 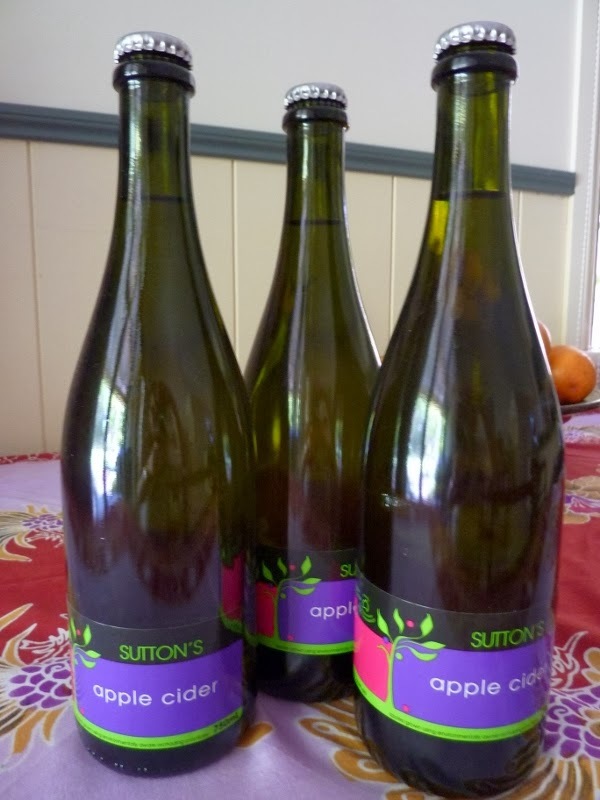 …are bottles of Sutton’s Cider. We picked these up when we visited Stanthorpe for the Australian Small Winemaker’s Show. More on this in a coming post. Suttons is an apple farm that is famous for its huge apple pies and juice. They’ve branched into cider and I’ve got to say I’m liking it! I’ve always been a huge fan of cider but until very recently, there were only two mass produced ciders on the market in Australia. Now, it’s the drink of the moment with an overwhelming explosion of flavours and colours, far outstripping the beer market in terms of growth. Sadly, most products on the market are not real ciders. They are over carbonated, sugary drinks with fake fruit flavourings catering to a generation who grew up on Vodka Cruisers and alcholic lemonades. If you look really hard, you can find one or two genuine articles and they tend to be imported from Europe. I have two fond cider memories – one of trying to buy a glass of cider on a particularly hot night in Paris and being told by the patron that one should never drink cider in the evening and serving me a glass of wine instead. The other is when we visited the farm shop at Middle Farm in Sussex where they have the ‘National Collection of Cider & Perry’ with over a 100 draught ciders and perries. It was in a huge barn with barrels of cider from all over the country lining the walls almost all the way to the roof. They were serious ciders. Most low in sugar, natural fermented and all available to taste. When you found your chosen cider, it was filled into a plastic milk bottle. The reason this memory if so vivid is the temperature was hovering around 0c and some of the ciders with lesser alcohol content were starting to form ice crystals around their taps. Anyway, it was balmy and sunny the day we bought these three bottles. It’s fizzy but not overly so and there’s a hint of sweeteness but it doesn’t make your teeth ache. These will be chilled for the coming humid Summer days (because they’re not far away). …is a jar of marinating cherries. After the success of the Strawberry & Rosemary Shrub, I’m making another. This time it’s Cherry & Lemon Thyme. I bough the cherries on the same weekend at the markets in Stanthorpe. Whilst it’s not quite cherry season yet, these were an early variety that had been grown locally. Not the usual monsters we see in supermarkets, these were small and came in clusters of two and threes. Some were sweet and some were sharp. After a few handfuls each, I decided to put the rest into a Shrub so I’d have one on hand for the upcoming party season. I’m also making a Rhubarb & Blood Orange flavour. I’ll write about both soon. In the mean time, here’s the link to the Strawberry & Rosemary Shrub Recipe. 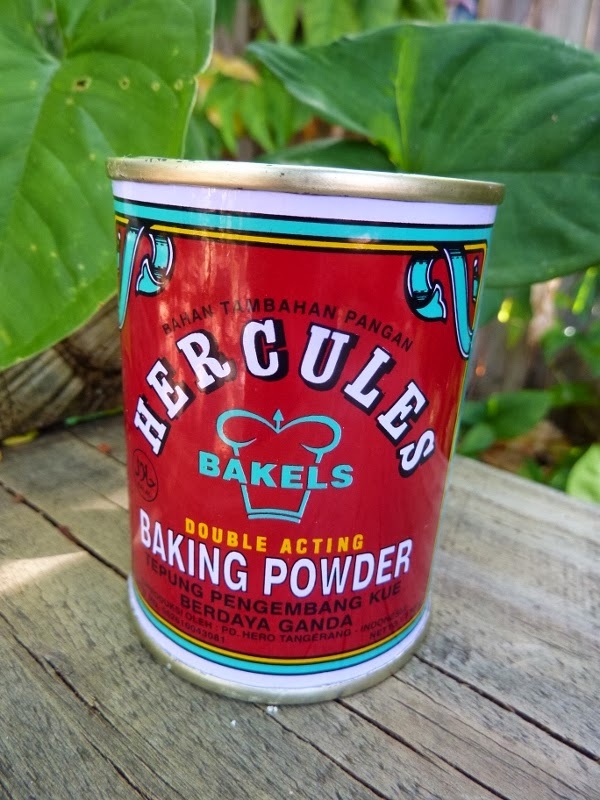 …is a tin of Hercules Baking Powder. I bought this tin of baking powder in Bali, mainly for the cute tin rather than the contents. After successfully navigating Australian Customs with my tin of white powder, it has languished in the cupboard. 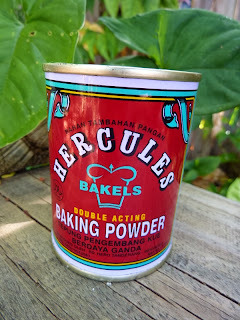 The Balinese not being known for their baking products, I hadn’t used it as I wasn’t convinced that it would work as well as my usual McKenzies baking powder. Yesterday I ran out of McKenzies and didn’t have another in the cupboard so it was time for Hercules to step up and show its might. I added a pinch more than stated just to give some extra oomph to my very forgiving Black Bean Brownie and was impressed by the results. It appears Hercules does live up to its name. …is this small, rectangular omelette pan. Designed to cook the sweet omelette that sits atop sushi, it came not from Daiso but another $2.80 shop called Danda. Selling basically the same stock as Daiso, it is very ‘conveniently’ located right next door to my hairdresser. I’m not planning on necessarily using this to make omelettes but though the unusual shape would come in handy at some stage. The instructions on the pan say ‘Please use on weak flame to prevent damage’…. In My Kitchen is coordinated on a monthly basis by coordination Queen, Celia from Fig Jam and Lime Cordial. It’s an opportunity for bloggers to talk about what’s happening in their kitchen and their lives and maybe include a few things that they haven’t had time to blog about. If you visit Celia’s blog, you can read about other In My Kitchen enthusiasts. Great round up of goodies, here, Fiona. Freshly picked, home-grown beans are the best! Thanks Liz. Just delivered a batch with a small cucumber and some cherry toms to the neighbours, who were thrilled. G'day round up and thanks Tiffin for your kitchen view! 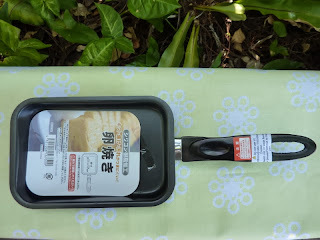 Love the rectangular omelette pan and love marinated cherries and am sooooooooooooooo excited to see cherry season once again return to South Australia too! The ones are marinating in vinegar & when drained, will go into a relish. I do have some cherries however that have been in brandy & sugar since 2007. Very boozy! So great to see your garden goodies. I am depending on OZ gardens to get me through the coming winter! I sit and gaze at the bounty and count the days until Spring! Those shops are dangerous! I do like the fact that you can pick up all sorts of fun stocking fillers. Wish Kewpie Mayo was $2.80! 'Please use on weak flame to prevent damage'? This wouldn't last two seconds in my kitchen! I miss having beans in my garden, they're always such a good addition. I don't think it will last long but for less than a cup of coffee, who could resist? Thanks for visiting Jasmin. I've never seen a rectangle pan before. Thanks for sharing. If you want one Gustoso, Danda is in Adelaide St, opposite City Hall. Just past the City Glider bus stop. Yes, I'm looking forward to tasting the shrub and using the cherries for something else. Once that cider is opened, it will go down very quickly! Thanks for your comments. I had no idea Daiso was in Australia. It's amazing what you can find in there. Those cherries look amazing too I hope there's alcohol involved in the upcoming post! Hi Nancy – yes, I discovered it wandering around the Myer Centre in Brisbane and my wallet is all the emptier for doing so! Hi Fiona, a great month in your kitchen. I'll keep a keen eye on the cherry shrub, I planted a tree and it actually has fruit! I discovered the $2.80 just recently for the first time, great piping bags! I can recommend any of the shrubs with a splash of vodka and soda. My brother sent me a photo of a batch of strawberry & ginger he'd made. It's soooo easy – you must have a go! Fiona, I loved your cider stories! When in Rome… (or Paris)… 😉 "Serious" cider is exactly as you described — folks don't know what they're missing. Also, not having to buy coffee for most of the year sounds grand! Hi Kim – thanks for your kind comments. My husband read the blog last night and we had a laugh about the bar in Paris. He said 'that's good that they know their stuff.' I said 'but I was gasping!'. The free coffee train has come to an end as those bags have no been ground. How lovely to see so many goodies in your kitchen that may never appear in mine. This series is so much fun. Yes, I see things that are never going to make it into my kitchen as they're geographically impossible. Still, I see bits and pieces in other's kitchens that motivate me to seek them out. Congratulations on your home grown beans! That's very exciting 🙂 Your cherries sound great too (yes, we are suckers for early summer fruit, both of us!). Thanks Kari. We have beans nearly every night, whether frozen or fresh so it's nice to be able to pick a few out of the garden every day. I'm on holidays this week and away. It's raining in Brisbane so I expect I'll have quite a few when I get back! Hi Fiona, I love the instructions on your pan. It reminds me of my favourite sign. I saw it in India in a restaurant. "The management will not be responsible for damage done by rats." I checked out your shrub recipe. I had never heard of shrubs. THAT, is priceless! The shrub is great and right up your alley – what are you going to do with all that vinegar you make? Free coffee since Easter? That is a sweet ride. We have two daughter who work for Starbucks, so we are used to the luxury of free coffee … savor it. I suspect the apple cider is actually 'Hard cider' you refer to (ie: it is alcoholic). The terms are interchangeable here in Australia. We are far more likley to refer to non alcoholic cider as sparkling apple juice. As I write, I've just had to buy my first bag of coffee. The gravy train is over! I love that baking powder tin & also would have risked the raised eyebrows of the customs people for it. The fact that it works is a bonus! Yes, it's cute. I also have some favourite Spanish smoked paprika tins that I buy from the deli just because they have a photo of a cool dude from the 70's with sunnies on. 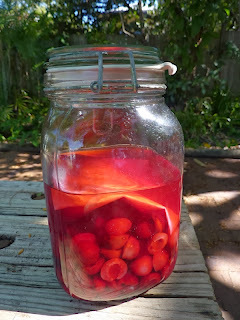 Just drained off the cherries for the shrub today. Looking forward to have some good new season ones in the next week or so. Ahhh….Summer!